While the muppets did exist before this, in skits, this is the first muppet story that was told. But except some interesting peeks at some early versions of a couple of them, most of the muppets in this movie are original characters. There's no Kermit. But there is Henson, Oz, and other puppeteers, and there is the creativity and love for the craft that you see in their later work. It seems like the used the chance to explore the technological limits of puppetry, as there are plenty of whole body shots, muppets flying in/through the air, arms and legs being in use, and so on. There's some scenes with lots of activity going on, and there's full body costumes too. All in all, it's impressive how much you see them doing already in this TV movie, early on in their career. The movie itself is alright. The plot is uninspired, but it does not take itself too seriously either. It's mostly an excuse for fun gags and technical experimentation, and for that it works brilliantly. I loved the gag where the elfs are gradually replaced by the bad guys, and how it affects the song they sing. 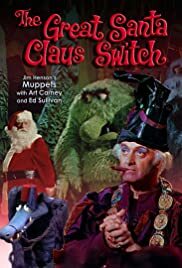 All in all it's a highly recommended watch if you like the work done by the Henson studio, and alright if you want a Christmas movie to see with your younger kids.